Back in the day, Erie Rising or Erie Moms Rising first hosted then Representative Jared Polis on a tour of fracking wells just a few feet from their homes where they told him that their kids were getting sick, that the noise was keeping them up at night, and that their school would soon see even more drills too close to their kids. “When they came in and drilled and fracked, the pictures shook, the pictures fell off of my wall. We didn’t know. We didn’t know anything about it,” April Beach of Erie Moms Rising that hosted Polis shared on that 2012 tour, “We didn’t start looking into dangers until after the first few months after they drilled the well. I got really sick for about 4 months, and my youngest son developed asthma, and my husband redeveloped asthma. We have a laundry list of medical problems that really exploded.” Beach added that she would feel guilty selling their home to someone with kids because of her experience. Erie Moms Rising doesn’t exist anymore. The moms caved to circumstances that didn’t allow them reprieve from exposure, and moved out of Erie. But other groups in Erie followed and many have taken additional steps to fight the industry close to their homes. While industry claims being blindsided by the current bill (SB19-181) making its way through the legislature, surely after many earlier bill attempts, various voter-approved bans that were rejected by the Colorado Supreme Court, moratoria in other communities and countless testimony at hearings held by the Colorado Oil and Gas Commission – sometimes with 100% challenging fracking in their communities – that industry would have expected sweeping changes with Democrats in control of all branches of state government. One might even argue that such is one reason that Democrats won some of their seats in the legislature, by supporting legislation to prioritize health, and by refusing oil and gas campaign money. One might even suggest that the industry would have their leading officials on top of this, ready for the expected. Surely at its first hearing on March 5 after 12 hours of testimony, mostly in favor of the bill by people who were not paid to testify, that passing of the bill could not have come as a surprise. It was not surprising to see industry officials testify early in the hearing, and then leave. Similarly it was not surprising to see impacted individuals stay until the end, which has usually been the case in other public meetings over the years, to give their testimony to an empty room. Though their testimony is recorded and archived, officials from the industry are not there to hear their cries for help and to see the look of despair on their faces. Most advocates who challenge the industry in their communities say the bill does not go far enough. They say that the section of the bill that challenges forced pooling – where those who are in the line of fire of fracking rigs have no say about whether minerals under them can be taken – doesn’t protect those who are below the 50% plus one threshold from being fracked, and then have been vulnerable to responsibility for accident potential of that fracking rig. They say that the portion of the bill that favors local control of drilling locations doesn’t go far enough either, at least for those communities who have attempted to ban the practice. Those communities have grown in number judging by the town halls where the chants to “ban fracking” drown out legislative hosts, by the number of speakers at city hall who, sometimes in tears, beg for support of their representatives to act on their behalf, and even by the number of people who voted in favor of November’s failed citizen initiative Proposition 112, despite a disproportionate funding by those who supported the bill against industry money that spent tens of millions to defeat it. Remember the proliferation of the red and white banners all over the state – in addition to the media ads – while proponents of the proposition ran a go-fund-me campaign to replace stolen yard signs? 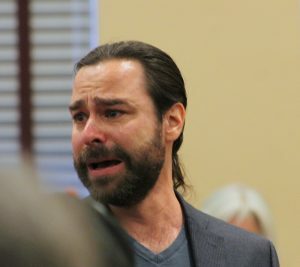 Gabriel Perry of Boulder weeps in 2013 as he describes his fear to Boulder County Commissioners that fracking will come to Boulder. Bill supporters argue that an industry that could spend tens of millions on advertising against Prop 112, and currently is running media ads against SB 181 is misguided and misrepresenting the economic impact that stricter regulations will have on the industry. They say that the tens of millions would be better spent on developing better emissions reductions infrastructure, more monitoring equipment, more inspectors, and as a long-term measure, to educate workers to transition to the renewable energy industry that appears to be outpacing oil and gas in economic promise. The Nation Report has a commitment to renewable energy, and has rejected the use of natural gas in our production, and in heating our location. Indeed we have missed deadlines, or have operated in the cold or hot temperatures in fulfilling that commitment, but we have prioritized what we feel is best for the community we serve and what the community has clearly emphasized that it wants. Although we see the land where we operate as actually belonging to those who originally occupied the region, we see ourselves as temporary guardians of this particular space, and will return it to its original owners in perpetuity. Those original communities have made it clear that the minerals under us are not ours, and that we are temporary protectors of this space. But it doesn’t much matter what we say at this point in history. The children have made it clear – especially on March 15 during their widespread climate strike – that they are in charge of their future and the up and coming will not stand for a future of poisoned land, air, and water. This entry was posted in Climate Change/Environment, Human Rights, Politics. Bookmark the permalink.